It doesn’t look like much. It’s about the size of a Toyota Camry, only a little bit narrower, a very classic 4-door sedan. It’s available with a 1.6-liter gas engine or a 1.5-liter diesel in Europe, but very few people buy one over here. Europeans prefer hatchs. Yet, there are other markets where buyers like, and buy, sedans. Renault develop this car for them. 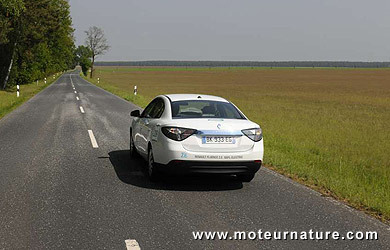 The Fluence is built in Turkey, and the largest market for the electric version should be Israel. 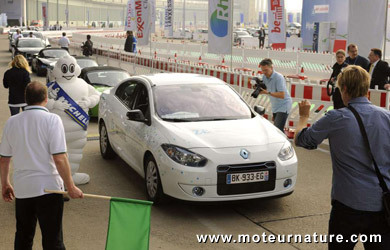 Few people in western Europe are interested, but this may change as the Fluence ZE was the most efficient in the road rally of Michelin’s challenge Bibendum. This is against logic. There were 3 Tesla roadsters competing against it in a 186-mile rally just South of Berlin. The Peugeot EX1, a very low and very light sports car was also taking part, and everybody was expecting one of 2-seaters to be the most efficient, but it was the 5-passenger Renault sedan that won. It drove the 186-mile with only 37.44-kWh. That is truly remarkable. I’ve read about cars doing better, but they were carbon-fiber 2-seater hand-built prototypes. That level of efficiency from a regular production sedan, meeting all safety regulations, is nothing but fantastic, and very promising for the future.